Iconic skyscraper says it wants to replace Chrysler building in Spidey battle scene. The Empire State Building wants to be featured on the set of "Spider-Man" instead of the Chrysler building. The Empire State Building has refused requests to light up the iconic skyscraper in honor of the long delayed Broadway opening of “Spider-Man: Turn off the Dark” because producers won’t change the set to put it in place of the Chrysler Building in the skyline, reports The New York Post. Broadway’s biggest blockbuster is set to unveil its revamped production next Tuesday. "Spider-Man" took a hiatus to give its editorial direction a face-lift following poor reviews and several onstage accidents involving cast remembers, one of whom ended up hospitalized with broken bones. The Empire State Building famously lights up to commemorate certain events, but building executives said the only way the landmark would light up for the musical would be if the electrifying battle between Spider-Man and the Green Goblin happened on the Empire State Building instead of that other, shorter skyscraper in Manhattan. Those who work on the $70 million production say the request is impossible. Another staffer pointed out that the Chrysler building was a key element of the super-hero series and the show. A spokesman for the musical told the Post that Spider-Man had “room in his heart for all of New York’s great skyscrapers,” but that wasn't enough to sell the Empire State Building on the lighting. 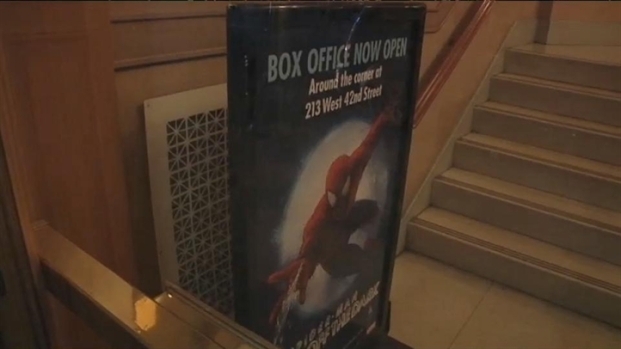 After not much more than an hour,"Spider-man Turn Off the Dark", in a statement put to bed rumors that director Julie Taymor of "Lion King" fame would be out, theatergoers at Wednesdays show came out for an intermission more than willing to talk about what they say called a technical glitch; one of many the show's had in previews. “We love Spider-Man, but the Empire State Building is the world’s most famous office building and the icon of the New York City skyline, and omitting it from the set isn’t the first misstep the ‘Spider-Man’ musical has made,” an Empire State Building source told the Post.